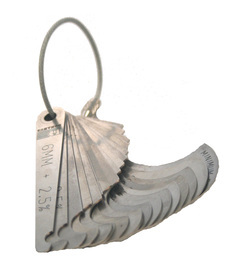 Stainless steel metric wire rope sheave gauge for the wire rope industry used to measure worn sheave grooves. Available in stainless steel removable cable or rivet with cutout for measuring wire rope or no cutout (specify when ordering). Tolerance for radius and cutout, if cutout: 2.5%. Laser-etched imprinting is also available. If you don't find the specifications you need, fill out this brief survey so we can meet your needs or contact Donahue Industries directly at sales@donahueindustries.com.